There is no better day, than today! Experience the difference working with a degreed exercise professionallaser focused on helping you achieve your fitness goals. There is no better day than today! Are You Ready? Are you looking for a plan that will finally help you lose those stubborn pounds and keep them off? Dieting alone does not work and there are no gimmicks, diet pills, or special supplements. 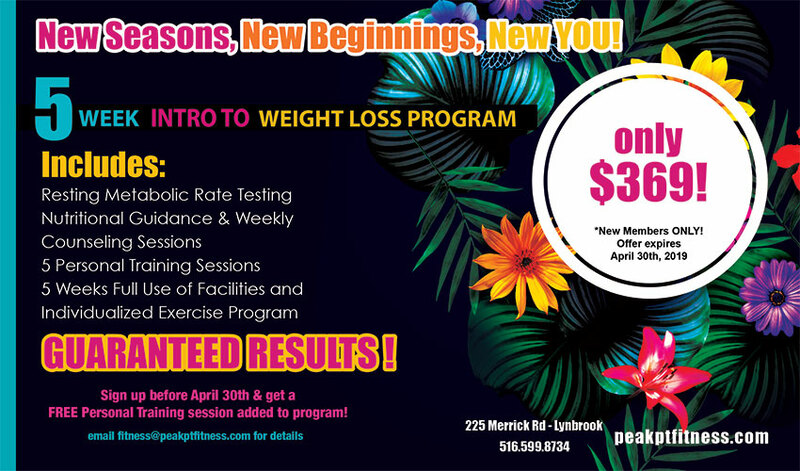 Our weight loss program is a comprehensive 12-week program that combines a supervised exercise program and individualized nutrition counseling to ensure weight loss success. Learn more about our personalized weight loss program! Personalized Fitness Programs Driving Your Success! Peak Performance Fitness is not your normal health club or gym. We offer degreed Exercise Professionals to help you reach all of your fitness goals. We are located in Lynbrook. We specialize in weight loss, personal training, sports specific training, VO2 & Resting Metabolic Rate Testing, Exercise and TRX training classes. Peak Performance Fitness is a facility that you will be completely comfortable and at home in regardless. In our non-threatening environment, you will thrive and feel empowered as you begin your journey into fitness. It’s a unique fitness center capable of dealing with all of your issues. Whether your goal is weight loss, reducing blood pressure, or be able to play with your grand kids, we will get you there. Get your Free Trial pass now!